Space isn’t really an issue. You could comfortably display your spices on the counter if you wanted to. But it just doesn’t look right. And even though the interior of your pantry isn’t always visible you care about the aesthetic within it as well. You just like everything to be tidy. But you’re getting bored – you want fresh ideas. 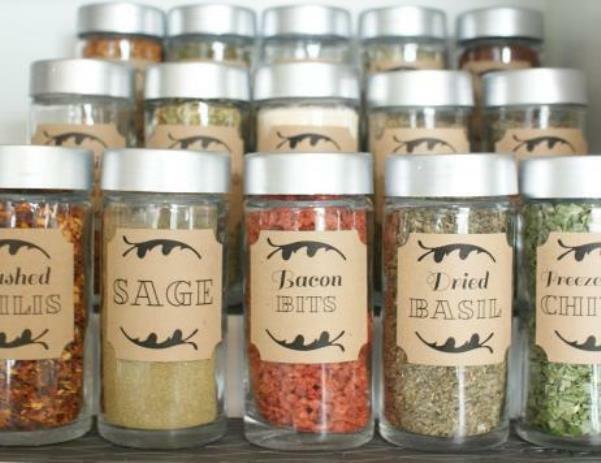 Hopefully much of this will be a surprise for you, as you learn that those countless small seasoning bottles can not only be stored together neatly but casually or super organized or even of artistic placement. You can be certain there’s a fresh idea waiting for you, one that allows you to mix things up while maintaining the status quo you are comfortable with. They can even complement your healthy lifestyle. It’s great if you are one to maintain a selection of fresh-from-the-store herbs. It’s even better if you prefer to grow your own. If you’re of the latter category, you may want to consider keeping you little plants by the window. See if you can find an antique copper herb bin from Laurel Leaf Farm and put it between the sink and just in front of the glass that drains directly into the sink. It’s an ingenious little contraption, perfect for growing herbs. They receive the amount of abundant light all plants need, can be watered easily and leave no mess. You may also find a good idea is to keep herbs handy with a range alcove. With it, the range is perceived as the center of attention and it features a number of fun ways to stockpile your products. 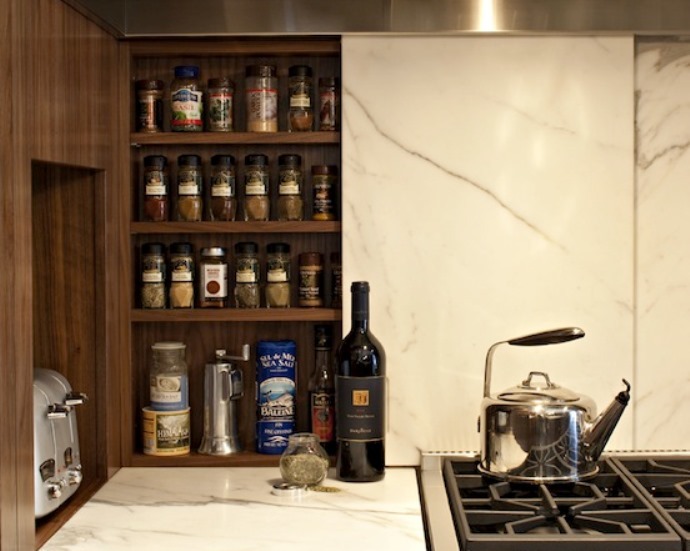 You can stealthily conceal or happily display all of your herbs spices and oils. There is an abundance of clever designs that will keep your spices in a place that is safe, away from potential damage caused by the heat of the stove. In fact if your ingredients are stored in that vicinity, place your hand over the wood enclosing it while you are cooking on the range top. 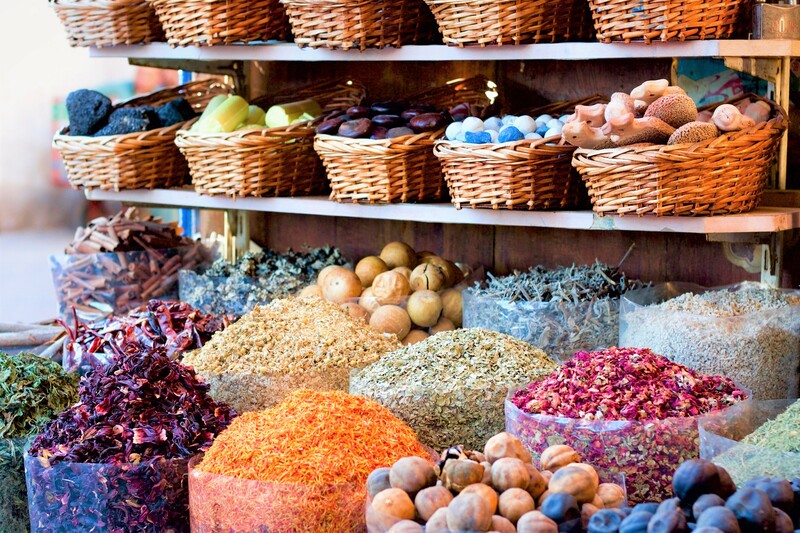 If it is very warm to the touch, your spice may benefit from being at a different location of moderate temperatures. Either that or just have a fan pointed to the overheated surface when cooking. Here’s an idea that is just for the secret agent set – a marble backsplash with a large secret compartment. People don‘t expect anything to be behind the marble, so this is a particularly fun and wild idea. For a more elegant architectural touch, look into a range mantel of wood that features pull out spice compartments on either side. Of course you could simply have a hanging rack that you can put in a niche or on the inside of the pantry door, or one designed to go beneath your upper cabinets where you may hang items by their lids! Or they can be stacked in a row along an exposed side of your kitchen island. So how about an idea that isn’t so much cunning as it is practical? 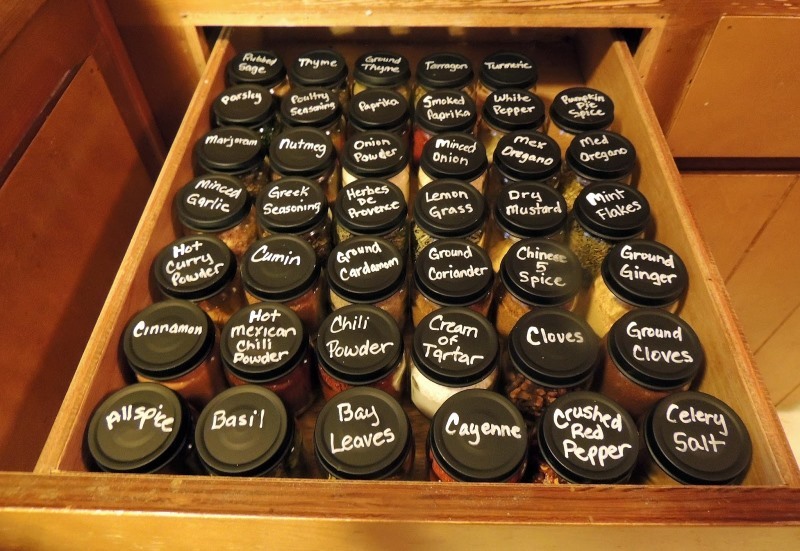 Not everyone can accommodate the fancy alternatives and there’s certainly nothing as simple as designating a drawer to be your primary herb and spice location. That’s not to say that there haven’t been innovations in the world of drawers. Label the tops of the containers and you can store them upright and easily identify them as needed. Or you can use slat inserts to lay the containers flat on their sides in uniform rows. With the labels visible you’ll be able to find what you need with ease. You may even seek out custom inserts to accommodate the variety of sizes spice bottles come in while keeping them stationary with the label always up. Let’s return to the sink, shall we? Growing your own herbs and spices is a great way to keep yourself supplied, especially if you do a lot of cooking. As mentioned originally, you can’t get much fresher than growing your own. So, install a rod and hook system over the sink in front of the window where it can soak up the sun. Yes, exact same concept as our first tip, only this requires a little DIY effort to get the tiny planters hanging. We hope you enjoy these minor yet effective lifehacks, guaranteed to indulge your zest for life with the tastiness of fresh seasoning. Previous articleSpring Cleaning: Tackle that Garage!